I have installed Meld and found out it's a great comparing tool. Unfortunately there is no integration with Nautilus 3.2. This means, I can't right click on files and select an option to open them in Meld for comparison. Ok, so from this output I gather that indeed gtk 2 is being required to install the diff extension to nautilus. Now, my question is: Is there a possibility to integrate Meld into Nautilus? Or, are there any other diff based tool which integrate with current Nautilus? So gtk3 based. I am using Ubuntu 11.10 if there was any doubt so far. Obtain the source or the deb package from the authors website. Search for pyextension in Dash and run Nautilus PyExtension. 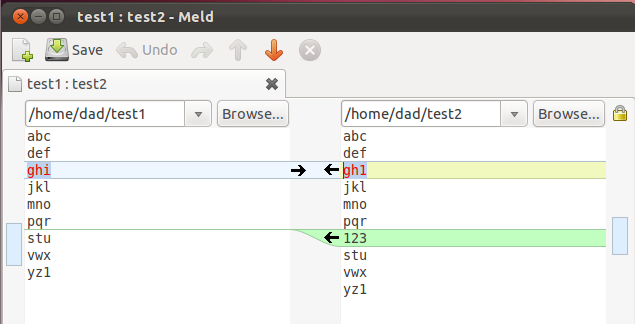 Activate the meld extension (install it if asked) and click the restart Nautilus toolbar option. 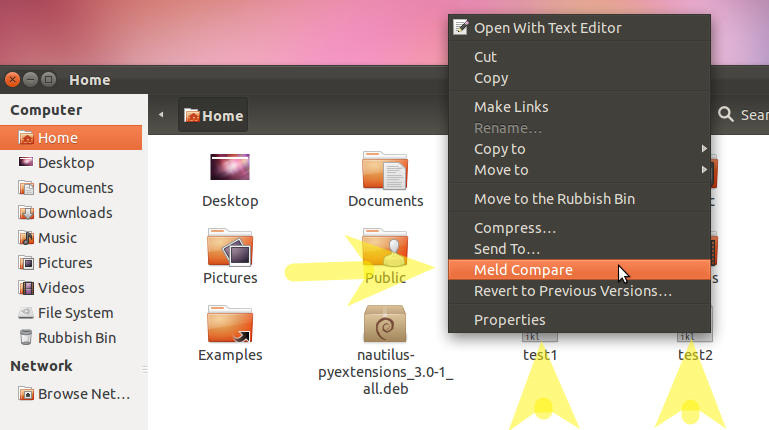 This provides nautilus menu options for 2-way and 3-way comparisons. Meld is used by default, but any user-defined diff application can be used. A significant advantage of this solution is that one can compare files or folders located in different directories (e.g. /home/user/a/b/c/file.txt and /home/user/d/e/f/otherfile.txt can be opened in different Nautilus windows, and compared against each other). Installation instructions: How can I install a Nautilus script? This answer is primarily used to compare a file to text in the clipboard that was copied from the internet. The clipboard text could have been copied from another file on your system though--making this an eligible answer. 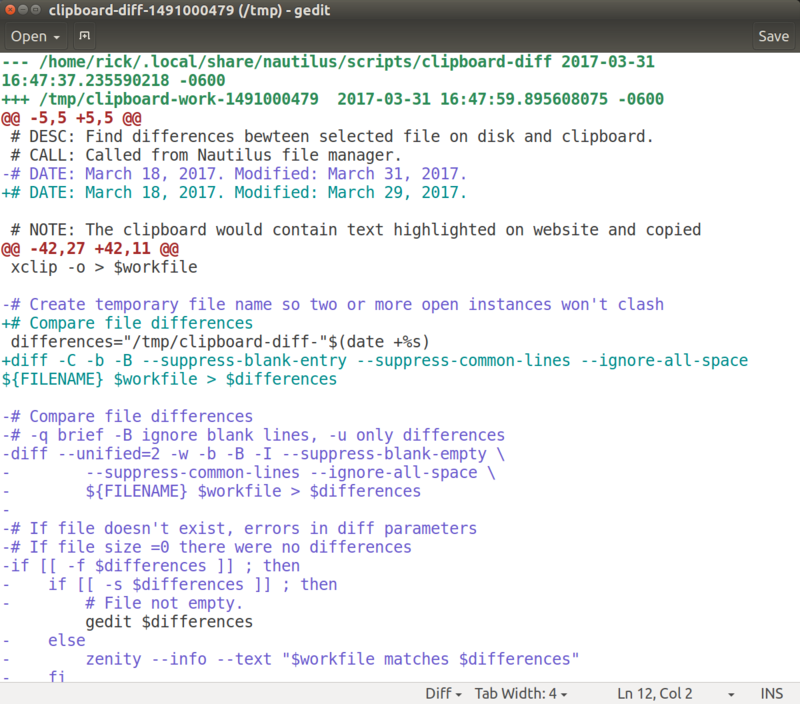 File differences are highlighted using bash's native diff command and then displayed using gedit. This can be modified to meld or any other third party package though. # DESC: Find differences bewteen selected file on disk and clipboard. # CALL: Called from Nautilus file manager. # DATE: March 18, 2017. Modified: March 31, 2017. #       with <ctrl>+<C>. Requires command `xclip` to be installed. # Multiple files can't be selected. zenity --error --text "Ony one file can be selected at a time! " zenity --info --text "$workfile matches $differences"
zenity --error --text "cliboard-diff - error in diff parameters." NOTE: I developed this Nautilus script a couple weeks ago and have been meaning to post it as a new Q&A but have been pressed for time and was unsure if anyone would really be all that interested in it. In this example we're comparing the actual script posted here in AU prior to March 31, 2017 to the version revised on March 31, 2017. Notice how new information and error messages were setup. The diff command is very powerful and as such has a myriad of control parameters. Type man diff in the terminal for the manual pages or info diff for more even more command usage details. Not the answer you're looking for? Browse other questions tagged nautilus gnome gtk3 diff or ask your own question. How do I choose 2 files to compare in Meld? How can I find out what plugins I installed for Nautilus? How to diff multiple files across directories? How do I make a unified patch with diff? What does | mean when diff is run on two files? How to make 'diff' output line-by-line?